Southampton manager Mauricio Pochettino believes Jay Rodriguez, Adam Lallana and Rickie Lambert all fully deserve their call-ups by England. The trio have been named in Roy Hodgson's squad for this month's friendlies against Chile and Germany. And Pochettino - who was named Premier League Manager of the Month for October - says they merit the recognition. Previous clubs: Burnley, Stirling Albion (loan), Barnsley (loan) Southampton. International caps: One Under 21 cap. 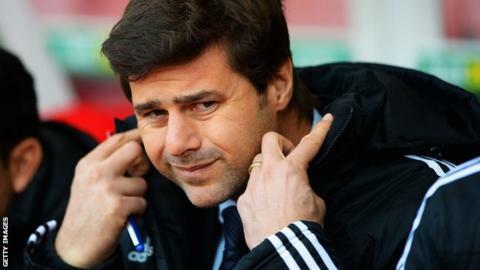 "I'm very proud for the three players who have been called up," Pochettino told BBC Radio Solent. Saints last had three players in an England squad in January 1986, when Peter Shilton, Danny Wallace and Mark Wright were in the team that beat Egypt 4-0. And with the side sitting sixth after a top-flight start only bettered in their history when finishing runners-up in 1983-84, Pochettino says he is delighted not only for the players, but also for the acknowledgements the club are getting. "It's really good news and I'm really happy for them," he said. "They fully deserve their call-ups, have worked very hard and I'm also happy for the entire Southampton family. It is good news for the club." Lambert already has three caps and two goals for England, while Lallana and Rodriguez are yet to make their debuts. Lallana has previously been involved in an England squad, but it will be a novel experience for striker Rodriguez, whom Pochettino believes is reaping the rewards of his versatility. "It's important for him and his confidence," he said. "It's always important to get called up by England and good confirmation that you are doing well. It shows he is progressing and is improving. "He is a versatile player and that has helped him win his England call-up. In modern football, players have to be able to adapt to different roles, and that has increased his importance." Saints also have several players in the Under-21 and Under-19 set-ups, including James Ward-Prowse and Luke Shaw, but Pochettino has urged caution over how quickly these players will progress to the senior squad. "These are young players and they have a long path to cover still," he said. "I'm sure they will play in the senior side, but we cannot get ahead of ourselves."